As Love Island contestants continue to worm their way into our lives we sit back with a bemused ‘hate to love / love to hate’ attitude to it all. To help fuel that complex relationship, the internet has squeezed out some fresh footage of a baby-faced islander from his short-lived time in a pop band. Thank you, internet. The islander in question? 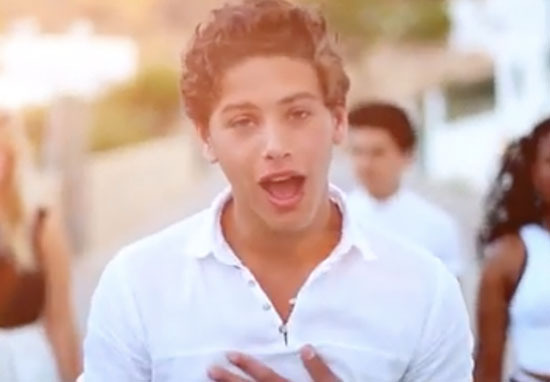 Eyal, of course! Self-professed ‘really deep guy’, stealer of hearts and re-coupling lothario, Eyal. The band? EverYoung. There’s not a great deal we could find out about the band, but then again there’s probably not much to find out. What we do know is that they all met while at the Sylvia Young performing arts school, and subsequently went on to tour school assemblies up and down the country. If it’s a choice between watching Eyal prance about on stage or double chemistry, I know what I’m choosing. There are also a fair few videos of EverYoung who look, as their name suggests, very young. First up, the EverYoung EPK (which stands for Electronic Press Kit), designed to give everyone a strong flavour of what the band is about, and acts as a good introduction to Jack, Hollie, Cherelle and Eyal. While there are many many moments of gold here, my favourite comes, surprisingly, not from Eyal but from Richard Flack, the band’s producer. Let’s create a definitive EverYoung sound throughout the recordings by having real musicians and instruments playing on the tracks. Sorry to be naive, but aren’t most (all?) recordings made by real musicians playing instruments? Anyway, back to the effusive Eyal and EverYoung. If you made it through all that, you may have noticed a certain Jeremy Irons playing the grumpy old cafe owner and, like me, thought to yourself what on earth is the highly regarded and very well respected thespian Jeremy Irons doing in this music video? And if, like me, you went in for a second viewing (perks of the job) you may have noticed that Irons never actually appears onscreen with any of the band, or anyone else at all for that matter. Which suggests he most likely filmed his parts on his own, probably on a different day in a different location. Elsewhere in the video, we see the band rebel against the grumpy owner by throwing their aprons off, standing on the tables and singing. And, after Eyal has led the crowd in a singalong, men with trumpets and trombones appear out of nowhere – how about that for ‘real musicians’?! Here we see the young popsters unfortunately breakdown in the middle of the desert. Handily, by the end of the video they’ve found new clothes, hats and horses and learnt how to be cowboys. Lucky that. If you’re still hungry for EverYoung, there’s more to watch over here, but right now I’m stuffed and couldn’t manage another bite. To be fair to Eyal, Jack, Cherelle and Hollie, some of the videos have racked up the hits. Looks like those school assemblies did the trick.